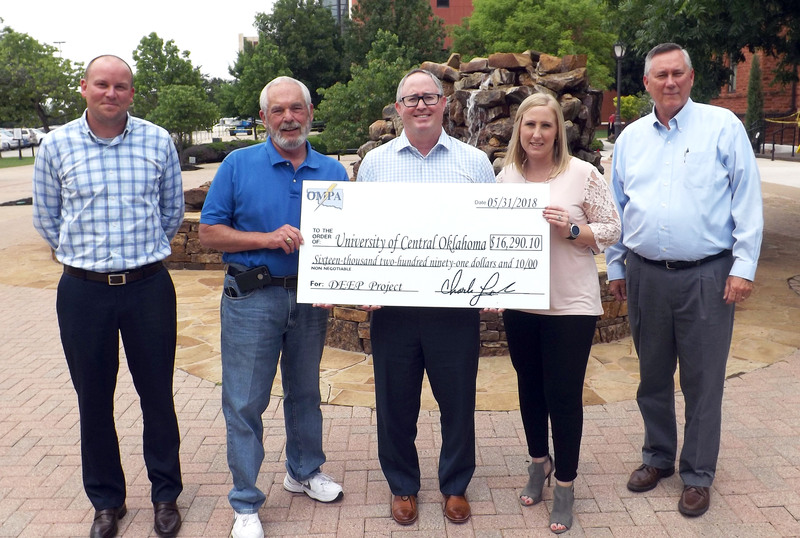 The City of Edmond and its power supplier, the Oklahoma Municipal Power Authority (OMPA), have presented a check for $16,290 to the University of Central Oklahoma for a recent project that improved the energy efficiency of the school. The rebate was presented as part of the Demand and Energy Efficiency Program (DEEP), administered by OMPA. 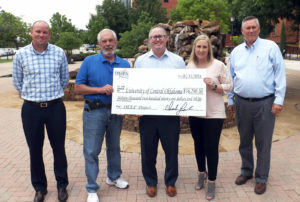 This was the third of three rebates awarded UCO in the past 14 months as part of the program. All three involved energy-efficiency improvements gained from upgrading lights to LEDs throughout campus buildings. In all, the three rebates totaled $166,821. The projects will reduce the peak demand on campus by 860 kilowatts. This most-recent phase of the project will result in a reduction in peak demand of 84 kilowatts. For more information on how to apply for a DEEP rebate, contact the City of Edmond.